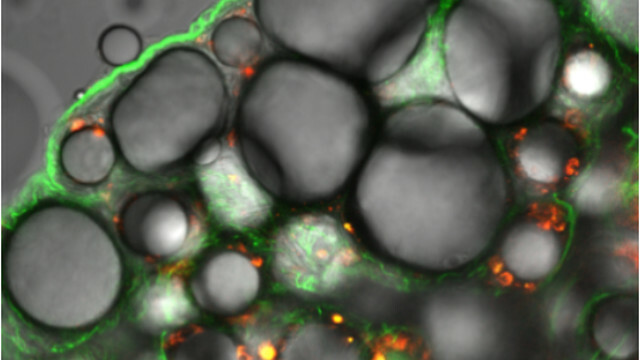 A small peptide helps a silencing construct home in on the adipocytes of obese mice. 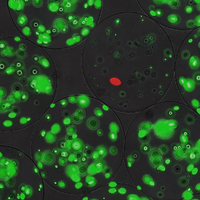 The technique: A specific short peptide aimed at fat cells can deliver a DNA sequence that knocks down expression of a key fatty acid binding protein. 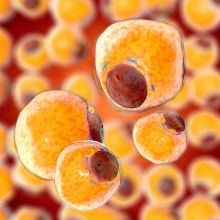 Mice on a high-fat diet treated with this molecular complex showed reduced body weight and improved metabolic profiles. The method, reported today (October 5) in Nature Materials, provides a new way to study the functions of adipocytes—a notoriously intractable cell type—and suggests an avenue for gene therapy to combat obesity in humans. “It’s always welcome when there is a new technology to deliver specific targeting molecules, whether they’re RNAi or small molecules, to restricted parts of the body,” said Gökhan Hotamisligil, a professor at the Harvard School of Public Health who was not involved in the study. Hotamisligil, who investigates the regulation of glucose and lipid metabolism, added that drug molecules or other broad strategies used to modulate lipid metabolism frequently have off-target effects on the liver or central nervous system. The history: Most drugs developed to treat obesity have focused on reducing appetite by manipulating signals in the gastrointestinal tract or central nervous system. These approaches have had limited success, and sometimes produce problematic side effects—the appetite suppressant sibutramine, for example, was pulled from the market in 2010 because it increased patients’ risk of strokes and heart attacks. 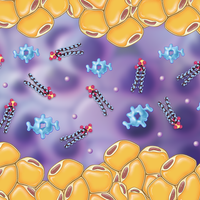 Controlling metabolism and immune responses by directly targeting fat cells, or adipocytes, is a more attractive strategy, but has been hampered by an inability to precisely and effectively deliver small molecules to adipose tissue. 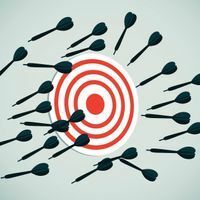 Previous attempts at gene therapy in adipocytes have employed viral vectors, which have led to unchecked expression with potentially harmful effects. Kim’s team produced a molecular complex containing ATS oligopeptides bound to expression vectors for a short-hairpin RNA directed against the FABP4 gene, which encodes a fatty acid binding protein that affects lipid storage in adipocytes. When the researchers injected this complex into mice on a high-fat diet, they saw a 20 percent decrease in body weight, as well as improved glucose tolerance and insulin sensitivity, after seven weeks of treatment. Needs improvement: Prohibitin expression is not unique to fat cells, and effects on other organs are a concern with this type of therapy. The authors also injected mice with a fluorescently labeled ATS construct, which showed far higher levels of expression in fat tissue than in the liver or kidney. Hotamisligil questioned whether other organs or cell types—in particular, macrophages within adipose tissue, which also express FABP4—might be unintentional targets of this approach. He added that he would investigate this before employing an ATS gene-delivery strategy in his own studies. Y.W. Won et al., “Oligopeptide complex for targeted non-viral gene delivery to adipocytes,” Nature Materials, doi:10.1038/nmat4092, 2014.